To better assist you, please call or e-mail to discuss your needs with the GIS staff. Upon arriving at the Division of Planning offices, please check in at the front desk. Please allow 3-5 business days for completion of the project from the time the request is received. Additional time may be necessary depending on the scope of the request. GIS data is available on an FTP (file transfer protocol) site for download. Please contact the GIS office for instructions. If you would prefer to purchase a CD/DVD with GIS data, the cost is $5.00. Please contact the GIS office to place an order. When submitting a request for GIS data, please provide location information such as: Municipality, Streets, Property Block and Lot. GIS Data available includes: Building Footprints, Road Centerlines, Tax Parcels, Streams, Water Bodies, Spot Elevation Points, and 2-foot Contours. 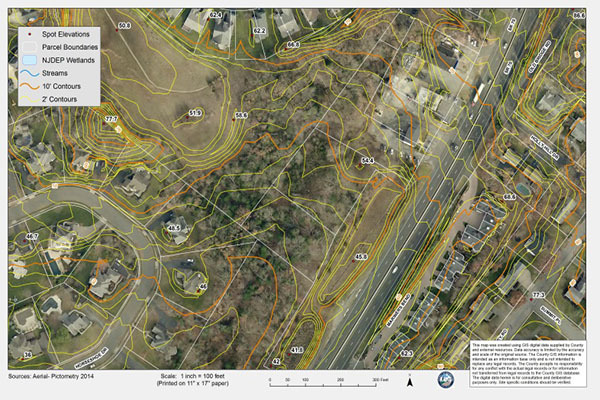 Electronic and hard-copy maps are available displaying aerial imagery and/or planimetric data layers (Building Footprints, Road Centerlines, Tax Parcels, Streams, Water Bodies, Spot Elevation Points, and 2-foot Contours). To order a map, please provide location information such as Municipality, Streets, Property Block/Lot and select any combination of the layers listed above; if aerial imagery is desired, please specify the year of imagery desired. The default map scale provided is 1 inch = 100 feet. 2014, 2011, 2009, 2006, 2003, & 1997 (natural color). 1990, 1986, 1981, 1974, 1969, 1957, 1954, & 1940 (black & white). Additional imagery years may be available through NJDEP and/or NJOIT. Letter-size (8.5 inch by 11 inch): $0.05/page. Legal (8.5” by 14”): $0.07/page. Tabloid (11” by 17”): $0.10/page. D-size (2 feet by 3 feet): $2.00/print. Letter-size (8.5 inch by 11 inch): $0.25/page. Legal (8.5” by 14”): $0.35/page. Tabloid (11” by 17”): $0.50/page. D-size (2 feet by 3 feet) with-out aerial image: $10.00/print. D-size (2 feet by 3 feet with aerial image: $25.00/print. Payments are by exact cash or check only, made payable to the County of Monmouth, due upon pickup of the maps. Please allow 3-5 business days for completion of the project from the time ordered. Please contact the GIS Staff listed below to submit a map request.